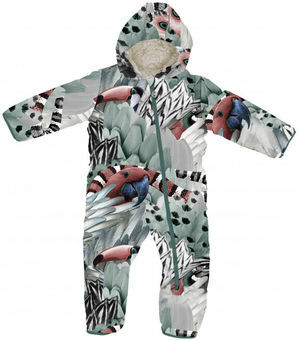 This baby snowsuit is lined with a super-soft fleece, the outside is made of polyester and has a water repellent and breathable outer layer. Easy to go outside with your baby, also on colder days. The zipper from the neck to the left foot on the front makes it easy to put the snowsuit on and diaper changes are no problem. The covers at the end of the sleeves can be worn over the hands of your baby, so no need to bring mittens or gloves. Fold the leg ends over your baby's feet to keep them warm. The adjustable design of the hood makes sure it always fits perfectly and it keeps the baby's head nice and warm. Отличный зимний комбинезончик! Легкий и теплый. Neatbilst izmēram , ļoti grūti rociņas dabūt ieksa..